The Lincoln Iris Society is pleased to announce that Michael Moller, current president of the Tall Bearded Iris Society, will be speaking Monday, March 31, 2014 at 1015 Lancaster Lane, Lincoln, NE (St. Andrews Lutheran Church). We will be meeting at 6:30 p.m. Guests are welcome! 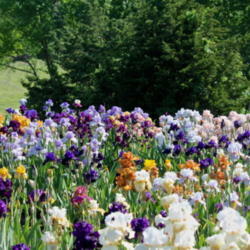 Mr. Moller bought his first irises from Schliefert Iris Gardens right here in Nebraska. He subsequently moved to Colorado, where he started the Dr. Loomis Iris Test Garden and served as President of Elmohr Iris Society and as RVP for Region 20. He is a master judge and has hybridized several introduced cultivars. He currently lives in Georgia. When I asked him what he would be speaking about, he enthusiastically replied, “Everything!” Pressed for specifics, he mentioned: how irises get their names, what’s wrong with the AIS judges handbook, and how to prepare your irises for shows. He emphasized that he wants all to bring questions. I’ve spoken with Mr. Moller several times on the telephone; we always take up most of an hour, and I come away educated and just tickled—he tells great stories. A grand time will be had by all. This is a rare treat, and we hope to see you there. The deadline for registration for our Society for Louisiana Irises Annual Convention is fast approaching. The convention dates are April 3-5, but registration is due in by March 15. SLI members and guests still have an opportunity to register and spend a few great days in historic New Orleans. On the garden tours, there are some great places to see irises and many other plants. Our convention website has all the details: http://www.louisianairisgnois.com/SLIConvention/ If you have specific questions, please feel free to contact me. If you are in the New Orleans area and cannot attend all the convention events, consider at least some of them. The Iris Show on April 4-5 in the Museum of Art is free and open to the public. The garden tours will be great. The dinners will be entertaining, especially the Silent and Live Auctions on Saturday evening. You can register for whichever events you can attend, but keep the deadline in mind. The tours, especially, may fill to capacity. Hope to see you in New Orleans. The AIS blog World of Irises has an entry by Renee Fraser of Aruba’s Eye-Popping Clump Shots. These are clump shots of irises by Brad Collins from his garden in Iowa. Congratulations to Brad and be sure to see his photos! One of the first signs of Iris Spring arrived yesterday, in the middle of a snowstorm! The first 2014 issue of the Greater Omaha Iris Society newsletter. Their first meeting is March 10th: Back to Basics: The Care and Culture of Iris in the Home Garden. You can see it along with back issues on our Newsletter page. And guests are welcome at their meetings.